Absolutely the closest condo to the slopes at Columbine! True Ski-in/Ski-out with the slopes just feet outside the front door, this end unit condo is light filled and ready for your next family vacation! With vaulted ceilings and lots of natural light, this home away from home is the perfect location whatever season. In the winter, there isn't a condo with better ski-in/ski-out access. In the summer and fall, the hiking trails are just steps from the front door. Located on Mt. Crested Butte with spectacular views overlooking the whole resort this property is definitely special. Remodeled just a few years ago this condo boasts an open floor plan with large kitchen, dining, and living areas. The vaulted ceilings create a great sense of space, and the large windows let in tons of natural light eliminating the cramped feeling you get in most condos. Entering this condo on the ground floor, one immediately walks into the living room with wood burning fireplace, large flat panel TV, and expansive windows. The dining area and fully stocked kitchen are on this level and boast a large breakfast bar for a quick bite in the mornings before you hit the slopes. There are also two bedrooms on this level as well as two full baths. Both bedrooms have two twin beds with the first bedroom capable of being converted to a king bed. Behind the kitchen is also a washer and dryer should you need to wash the kids clothes after a great day of being outside. Upstairs is the master bedroom with king bed and en-suite bath. Large windows in this bedroom make it spacious, light filled, and a great place to watch the aspen leaves change color in the fall. 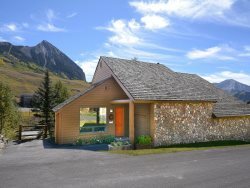 Skiing, hiking, fishing, biking, or any other activity Crested Butte is famous for are easy access when staying at Columbine 2108. Or perhaps the best activity of all, just relaxing and letting the world go by! Great ski-in, ski-out property. Definitely want to rebook for next year. Property Manager-Professional and accurate in all dealings. We stayed at this condo Jan 17th-24th and it was a wonderful experience. This is as close to a ski in, ski out as you can get. One issue that could pose for beginner skiers is the ski in, ski out is not a smooth bunny hill. We had one in our group that was a first timer and he struggled a bit, but it was not a big issue. The condo itself could not have been more perfect. The living room is a little tight for everyone to gather around for a movie night, but did not make the experience a negative one. The 3 full bathrooms for this place cannot be beat and worked well for our party. Also, the property manager was able to provide a pack n play and high chair for our 7 month old son for a small fee. This was a huge help as we did not have to transport this during travel. Overall this was a 5 star experience and I would not hesitate to book this place again in the future. We had such a great time in this condo, close location to everything and literally skiing right out the door. The Fox came for a visit and we had lots of room here. My family and I (wife, 3 children) stayed for a few days in Feb. Location is true ski in/out. Plenty of room for our entire family. Living space, bathrooms, kitchen, and all bedrooms were nicely appointed and clean. Wood for the real fire place was neatly stacked right outside the front door. WiFi was strong and supported a laptop, iPad, and 3 phones. You can easily walk down to the base area for food and activities, takes a little more effort to get back up the hill to the condo (in a good way). The condo is an end unit which gives the best views in the complex. We will be back again! Every single rep I talked with was knowledgeable and informative. They were very helpful in helping me coordinate restaurants and lift tickets for our stay. We had a wonderful week in the mountains. We all wish there had been a little more snow, but we made the best of it. A very professional team including Katie and Keith! I was very pleased with professionalism and friendliness of the staff at Iron Horse property. This is my second property I have rented through Iron Horse properties, and I was as pleased this time as i was with the first property. I will be using their company in my future rentals. Great location. This particular condo was recommended by Iron Horse because of convenience and view. They were absolutely correct. Kids and grandkids loved being at the base of the mountain. They also enjoyed hiking around the area each day. We'll rent from you again soon! Professional and accurate in all dealings. Great ski-in, ski-out property. Definitely want to rebook for next year. While we were there, we experienced an enormous amount of snowfall and called once about the condition of the parking lot (our car got plowed under a little) It was taken care of immediately and the caretaker at the property was just so nice. Columbine 2108 far exceeded our expectations on every level! The location literally cannot be beat. The furnishings and overall feel of the place was just perfect. We were there with a total of seven adults and never felt too crowded. I cannot recommend this property or this management company enough! We will definitely be back! Enjoyed conversations with Robert. Very friendly.